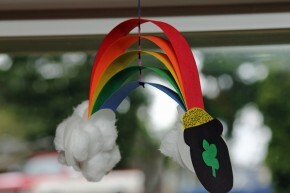 St. Patrick's Day Rainbow Craft for Kids! 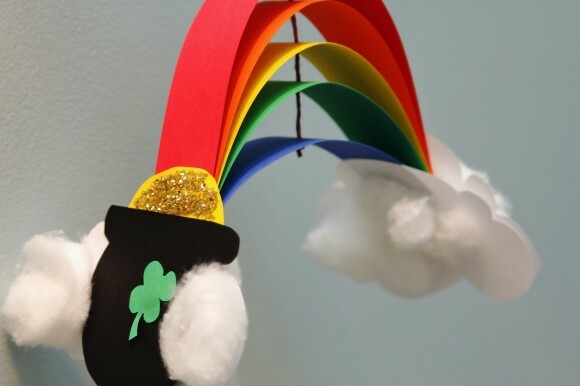 - Pi'ikea St. | Pi'ikea St.
Here’s a cute rainbow craft to put together for St. Patrick’s Day. 1) Quarter-fold your white paper. Keep it folded and draw a cloud shape on one side. Then cut the shape out. When you’re done, you should have four cloud pieces. You’ll need just 3 pieces for this project. 2) Flip one of the clouds over (this way the edges will match when you sandwich two together). Glue on some cotton balls. Set aside to dry. 3) Cut a cauldron shape out of black paper. Glue on a four-leaf clover for good luck. 4) Cut a yellow semicircle which is slightly smaller than the opening of the cauldron. To give your pot of gold a sparkly look, glue on some gold glitter. Glue the semicircle to the back of the cauldron so that the yellow peeks out the top. Set aside to dry. Gather the unstapled ends so they are lined up and staple together. 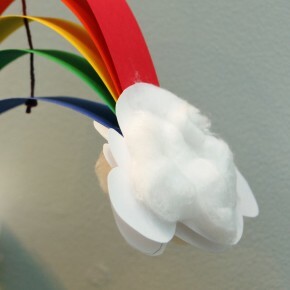 6) Now get two cotton clouds from step 2 and sandwich them to one end of the rainbow with glue or tape. On the other end of the rainbow, glue or tape the final cloud and your pot of gold. 7) Punch holes in the middle of each color strip. Feed in some string and tie a knot under the rainbow. Hang your creation by a window. Don’t forget to wear some green this Saturday. Happy St. Patrick’s Day! Summer what do you think about this for tonite!